After a relaxing couple of weeks in Cabo, I have been immediately hit by how badly SCA homeowners are being treated by our highly compensated and highly self-serving agents. 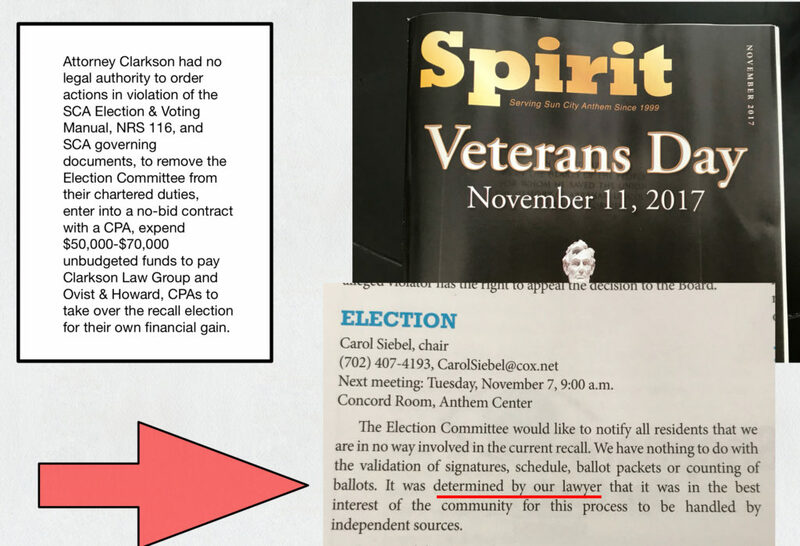 This first example from the November Spirit demonstrates how our well-meaning volunteers on the Election Committee have been duped into allowing the GM and attorney to violate the integrity of the removal election process at great expense to the membership. Who gives the association attorney the power to make such decisions? No one. At least not legally. NRS 116 does not give an attorney who is advising the Board ANY authority to decide any policy issue. NRS 116 does not give the attorney ANY authority to advise the Board to violate any provision of Federal, state, or local law or of our governing documents or policies. NRS 116 does not give the attorney ANY authority to require the Board or the GM or a committee to take it not take any particular action. The buck stops with the Board, and they can only legally delegate some of their duties, but can’t delegate ANY of the ultimate accountability. The GM is a licensed manager, and she can’t get out of being accountable for the standards of practice listed in the law by getting the attorney to say its okay to break or bend the law. None of the legal requirements were followed in this case, just as they are frequently ignored in other cases, for self-serving purposes and not for the benefit of the membership of the association. I would like to point out that the issue of the Board President Rex Weddle, the GM Sandy Seddon, and the former-CAM Lori Martin taking actions in excess of their legal authority to interfere with the removal election process is the subject of numerous complaints and is currently under investigation by NRED. If their defense is simply that “the lawyer said we could do it”, they better be ready to take their wallets out. I would expect that feeble excuse to fall on deaf ears. As you’ve no doubt noticed, the instructions on voting are confusing and the normal voting procedures have been changed. Here are some answers to the most frequently asked questions. What return address do I put on the envelope if I own multiple properties in Sun City Anthem? Put the address where each ballot was mailed. You may also note each property address on the outside envelope that contains the ballot envelope for that property’s vote. Should I write the property address on the ballot envelope? No. Do not write anything on the ballot envelope. What if I mailed my ballot in without any return address? Contact Ovist & Howard at (702) 456-1300 for replacement ballots. Ballots without a return address that matches where a ballot was mailed will not be counted. What is the deadline for my vote to count in the removal election? Can I drop my ballot off at Anthem Center? No. Your ballot must be mailed or hand delivered to Ovist & Howard 7 Commerce Center Dr. Henderson 89014 so it is received before the 5 PM, October 26 deadline. If my ballot got coffee stains on it, can I copy my neighbor’s ballot? No. Only original ballots will be counted. What if I threw my ballot away by mistake? Contact Ovist & Howard at (702) 456-1300 for a replacement ballot. How do I complain if I think this election is unfair? Contact the Ombudsman or the NRED Investigator or both. You may also contact the investigator who is assigned to coordinate the numerous complaints currently filed against SCA Board, GM Sandy Seddon and attorney Adam Clarkson. Will it do any good to complain? There are already serious complaints submitted to the Ombudsman against Sandy Seddon, Attorney Adam Clarkson, and BOD President Rex Weddle. It is important that the enforcement authorities hear from you as well if you believe the process has been made unnecessarily difficult or if you believe votes are unfairly not being counted. Contact the HOA Investigator Christina Pitch, assigned to SCA complaints, including election interference, if you want your concerns on the record. I have submitted several complaints to the Ombudsman, including several related to removal election interference. They have all been referred to the HOA Investigations Unit. On September 29, Section Chief Darik Ferguson instructed me to address all communications to Christina Pitch. Christina Pitch’s email address is cpitch@red.nv.gov. Two of my complaints are provided here as examples. The Update was provided for reliance in relation to an oral summary of the status of the review of the petitions/removal election to be given at the meeting, and the update was drafted in a manner to be read aloud, not conveyed in writing. Written documentation will not be provided as part of the board book. This is an example of the many dirty tricks management is using to prevent the Sun City Anthem owners from knowing about the recall election which could remove the directors who are protecting her instead of the homeowners and who are abdicating too much policy authority. 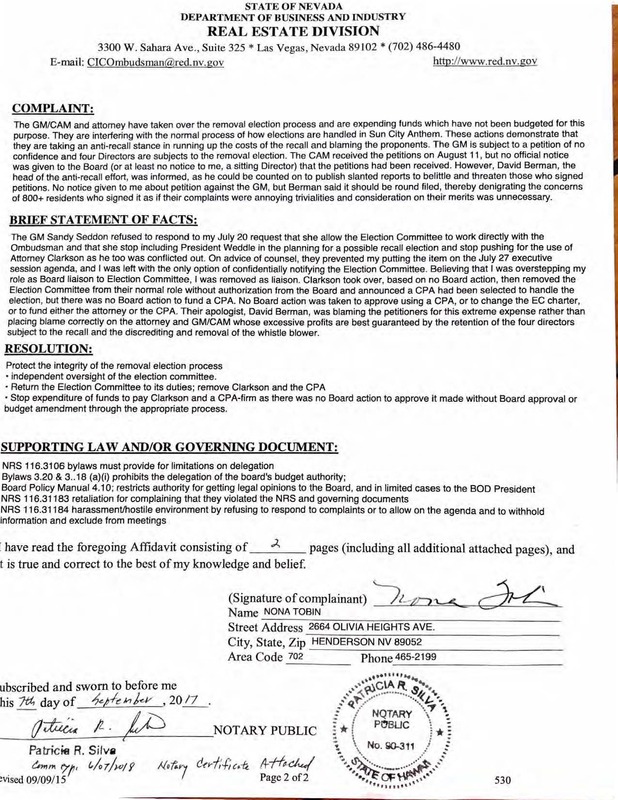 After I submitted my complaint about how management and the attorney and board President interfered with the collection of names for the petitions, interfered with the neutral election committee, they continued to escalate by removing the election committee from the entire process in violation of SCA Election and Voting Manual, contracted with a CPA without any public adoption of such a contract or it being approved as it was not in the budget. Thank you for your consideration of this additional information. I hope you understand the urgency because the ballots will be mailed on October 9, and owners’ completed ballots must be received by mail only by 5 pm (October 26) at the address of the CPA. Voters are being forced to jump through hoops that have never existed in prior elections and which they will not be told about until it might be too late. It is extraordinary chutzpah to kick me off the Board by a secret vote of six board members on unproven false charges and without a removal election just two weeks after petitions calling for an election to remove four of them were filed. Please don’t let them get away with it. My notarized & filed election interference complaint was referred to the Investigations Unit on Sept. 18 after the Board refused to respond AT ALL to the complaint on its merits (given to them on Sept. 2) or take any action whatsoever.